Researchers at MIT have shown that a MOF (metal-organic framework) with high electrical conductivity—Ni3(2,3,6,7,10,11-hexaiminotriphenylene)2 (Ni3(HITP)2)—can serve as the sole electrode material in a supercapacitor. This is the first example of a supercapacitor made entirely from neat MOFs as active materials, without conductive additives or other binders. The MOF-based device shows an areal capacitance that exceeds those of most carbon-based materials and capacity retention greater than 90% over 10,000 cycles, in line with commercial devices. Given the established structural and compositional tunability of MOFs, these results herald the advent of a new generation of supercapacitors whose active electrode materials can be tuned rationally, at the molecular level, the researchers suggested. A paper on their work is published in the journal Nature Materials. Because EDL capacitors (EDLCs) draw their superior power density from a combination of high electrical conductivity and high surface area, materials that possess both of these properties are required for robust, efficient devices. Such materials are rare. In fact, the active materials used thus far in EDLCs have been exclusively carbons, such as activated, templated and carbide-derived carbons, carbon nanotubes and, more recently, graphene. Transformative advances in EDLCs may thus be expected not just from developing better processing or synthetic techniques for carbon materials, but also from developing entirely new classes of active electrode materials that maximize both surface area and electrical conductivity. One class of materials that far surpasses even the porosity of activated carbons is metal–organic frameworks (MOFs). Conventional MOFs exhibit surface areas exceeding 7,000m2 g−1, yet their use in EDLCs has been limited as precursors/templates for carbons (via pyrolysis), or as hybrid composites with conductive additives such as graphene, because their electrical conductivity is typically much lower than that of graphitic carbons. Here, we show that the previously reported MOF Ni3(HITP)2, which exhibits a bulk electrical conductivity greater than 5,000S m−1, exceeding those of activated carbons and holey graphite (∼1,000S m−1) and on par with that of graphite itself, functions as an active electrode material for EDLCs. Although MOFs have an extraordinarily large surface area for their size—much greater than carbon materials do—their lack of electrical conductivity has been a major impediment to their application in a supercapacitor. One of the long-term goals was to make these materials electrically conductive, said Mircea Dincă, an MIT associate professor of chemistry who led the work. However, the material also exhibited another needed characteristic for such electrodes, which is that it conducts ions (atoms or molecules that carry a net electric charge) very well. Another advantage of the material used in these experiments is that it can be made under much less harsh conditions than those needed for the carbon-based materials, which require very high temperatures above 800 degrees Celsius and strong reagent chemicals for pretreatment. The team says supercapacitors, with their ability to store relatively large amounts of power, could play an important role in making renewable energy sources practical for widespread deployment. They could provide grid-scale storage that could help match usage times with generation times, for example, or be used in electric vehicles and other applications. The new devices produced by the team, even without any optimization of their characteristics, already match or exceed the performance of existing carbon-based versions in key parameters, such as their ability to withstand large numbers of charge/discharge cycles. Tests showed they lost less than 10% of their performance after 10,000 cycles, which is comparable to existing commercial supercapacitors. Comparison of areal capacitances among various EDLC materials. Comparison of areal capacitance for various materials normalized relative to their BET surface areas. Values were plotted either from references where they are reported as such, or were calculated based on reported capacitance and BET surface area. Sheberla et al. Click to enlarge. But that’s likely just the beginning, Dincă says. MOFs are a large class of materials whose characteristics can be tuned to a great extent by varying their chemical structure. Work on optimizing their molecular configurations to provide the most desirable attributes for this specific application is likely to lead to variations that could outperform any existing materials. We have a new material to work with, and we haven’t optimized it at all. It’s completely tunable, and that’s what’s exciting. While the MOF material has advantages in the simplicity and potentially low cost of manufacturing, the materials used to make it are more expensive than conventional carbon-based materials, Dincă said. Even if the material ends up being more expensive, however, if its performance is significantly better than that of carbon-based materials, it could find useful applications, he added. This discovery is very significant, from both a scientific and applications point of view, said Alexandru Vlad, a professor of chemistry at the Catholic University of Louvain in Belgium, who was not involved in this research. 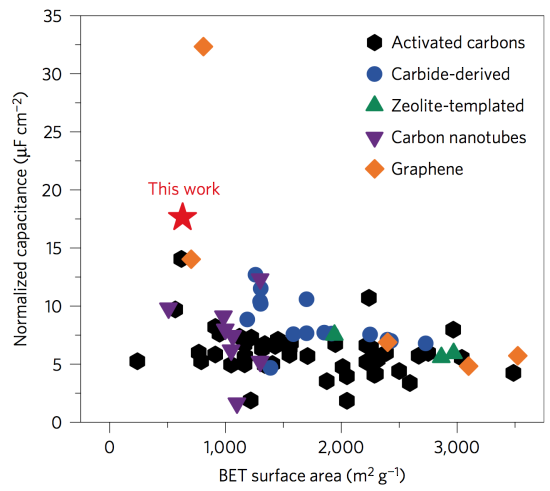 The supercapacitor field was (but will not be anymore) dominated by activated carbons. Here is the breakthrough provided by Dincă et al. : They could design a MOF with high surface area and high electrical conductivity, and thus completely challenge the supercapacitor value chain! There is essentially no more need of carbons for this highly demanded technology. This work shows only the tip of the iceberg. With carbons we know pretty much everything, and the developments over the past years were modest and slow. But the MOF used by Dincă is one of the lowest-surface-area MOFs known, and some of these materials can reach up to three times more [surface area] than carbons. The capacity would then be astonishingly high, probably close to that of batteries, but with the power performance [the ability to deliver high power output] of supercapacitors. The research team included former MIT postdoc Dennis Sheberla (now a postdoc at Harvard University), MIT graduate student John Bachman, Joseph Elias PhD ’16, and Cheng-Jun Sun of Argonne National Laboratory. The work was supported by the U.S. Department of Energy through the Center for Excitonics, the Sloan Foundation, the Research Corporation for Science Advancement, 3M, and the National Science Foundation.